Rabies in dogs is a virus that affects the brain and spinal cord, and it is always fatal. This is why vaccinating against rabies is so important for dogs. The disease is mostly passed through bites because infected animals secrete a large amount of rabies in their saliva. When symptoms of rabies in dogs appear, they generally include behavioral changes, paralysis, and eventually death. Rabies can affect dogs and any other mammal, including humans. In fact, rabies kills more than 50,000 humans and millions of animals each year around the world. Dogs that come into contact with wild animals are more likely to contract rabies, and un-vaccinated dogs are at much greater risk. The disease usually takes two weeks to four months to incubate in dogs, though it can take even longer. Here is what you should know about the symptoms, causes, and prevention of rabies in dogs. In the paralytic stage, the mouth hangs open, saliva drips off of it, and the affected dog can’t eat or drink. Once they become dehydrated, total paralysis follows, and death occurs soon after. Any animal or human bitten or scratched during either period is considered exposed and needs treatment. Unlike the human form of the disease, canine rabies does not cause hydrophobia, or a fear of water. Obviously, if you see any of these symptoms — in fact, even if you suspect that your dog has been exposed to rabies — go to a veterinarian immediately. The most common way rabies is spread to dogs is through the saliva of an infected animal entering through a bite wound, though it can also be spread through mucus membranes or from a scratch or open wound. Although the Centers for Disease Control recently announced that canine-specific rabies has been eradicated in the U.S., rabies is still out there among other animals in the wild, and your dog can get it if he hasn’t been vaccinated. 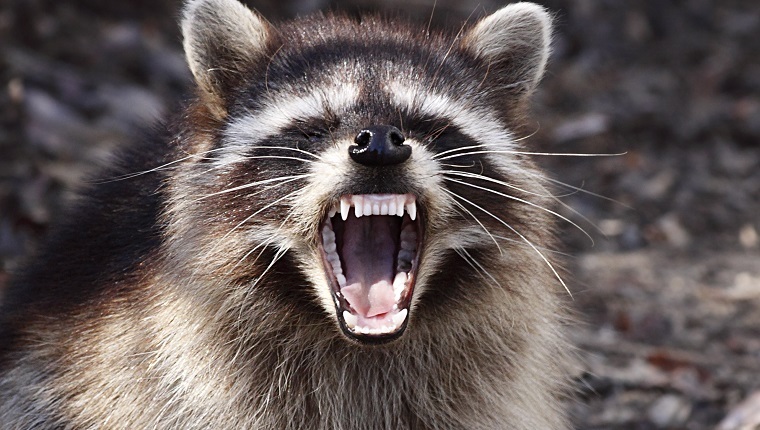 In fact, since the 1970s, there’s been an epidemic of rabies among raccoons, and more than half of the cases in dogs originated from that particular wild beast. The rest have come from skunks, foxes, and bats, in that order. The most likely form of transmission is through a bite from an infected animal (not via fleas, mosquitoes, or other insects), though there have been rare cases of transmission from breathing the air in bat-infested caves. 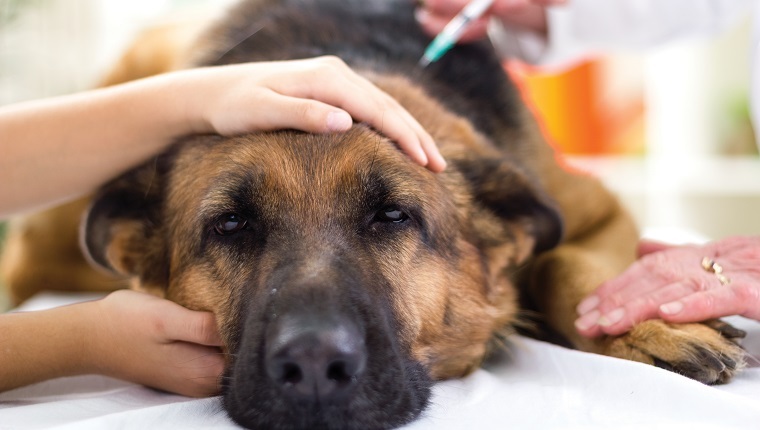 If you believe your dog has been exposed to rabies, the usual veterinary procedure is quarantine of up to six months for un-vaccinated dogs and 10 days for dogs that have been vaccinated. You must provide proof of vaccination to your veterinarian. Sometimes it is possible to interrupt the progression of rabies immediately after a bite by injecting rabies antiserum, which contains antibodies. The disease is always fatal once symptoms appear, and should that happen, the infected dog will most likely be euthanized. Veterinarians are required to report suspected cases of rabies to a government health department. Prevention is the best course of action in dealing with rabies. Make sure your dog is vaccinated. The vaccine is only effective if it is given before the virus enters the nervous system. 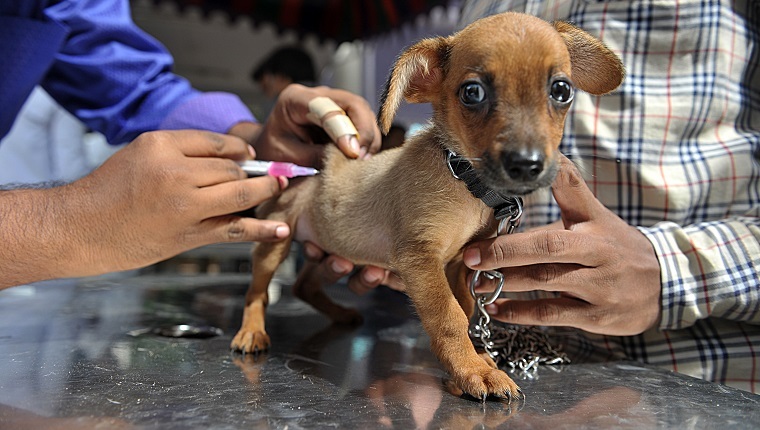 In the United States, rabies vaccination is mandatory for dogs, as are rabies boosters. Some veterinarians have suggested that mandatory vaccination laws are out-of-date, and that over-vaccination poses health risks. 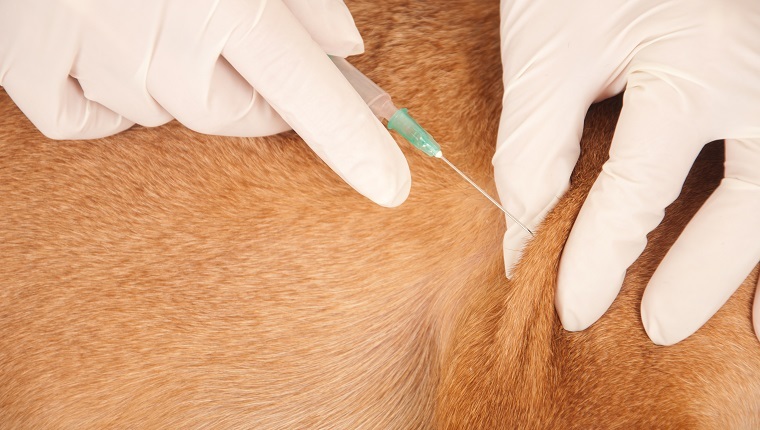 They suggest that titer tests, which measure the antibodies present in a dog’s bloodstream, indicate that rabies vaccinations are effective for longer than previously thought, maybe even for life. Until more research is done and new legislation is passed, regular rabies vaccination is a legal requirement for dogs in the United States. Staying away from wild animals is also helpful in preventing the transmission of rabies to dogs. Vaccinated dogs that are bitten must still undergo quarantine and will likely get another booster shot as an added precaution, though if antibodies are present in a dog’s blood, they will generally be safe from rabies.